Meet Sabra who co-founded Little Bellas (a wonderful program that gets girls on mountain bikes) with her sister, Lea Davison. Women working together to bring biking to the younger generation. 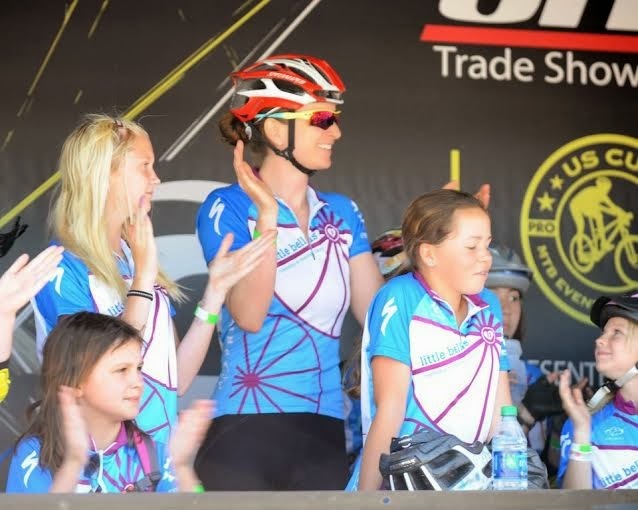 A bicycle can bring so much confidence and inspiration to someone, so a resounding "Thank You" to these two sisters on helping the future generation of riders! My sister and I always rode our bikes as kids, but took a break during middle school because to organized athletics. We picked it back up and started racing immediately. Mountain biking seemed like the perfect fusion between downhill skiing and running cross country, our two favorite sports in high school. It sounds like you and your sister were natural competitors or were you introduced to it by family/friends? Lea and I are most definitely natural competitors. My mom unknowing trained us for competition from a young age creating games for us to play every minute of the day. We were competing at sidewalk chalk, holding our breath while swimming, and any other random game my mom could come up with for fun. It was a great interactive way to grow up, so Lea and I naturally took to athletic competition. We were introduced to mountain biking by a boyfriend of Lea's at the time. At that time, we had Walmart bikes, so my parents tried their hardest to provide us with the equipment that we needed to be successful. So my dad fixed up some old road bikes with downtube shifters and we all pitched in on a nice racing mountain bike. It was a family effort. It also sounds like you and your sister are pretty close, especially since you shared riding together. Would that assumption be true? Also, did it keep your relationship pretty good? Lea has been my training partner, college classmate, teammate, business partner, best friend, sister, and my favorite person in the world. To say that we are close is an understatement. I'm so proud of Lea and all her accomplishments, and couldn't be happier to call her family. We have navigated the world as a team and continue to do so. She's the best! The love of it! I used to race a lot and now I get to ride when I want to. So, I've had to learn how to ride in a new way that wasn't geared toward training. Bike tour guiding helped me do that, teaching me to slow down and look around. It's also easy to stay motivated to ride when you job is riding with the Little Bellas. They are the best riding buddies! I spend most of my time riding with 8 year olds and occasionally acting as a carrot for my rabbit/Olympian of a sister. How hard was it mentally/emotionally at the start to pull back from your typical competitive riding so you could work with the Little Bellas? Totally! The program is non-competitive, and Lea and I occasionally have to remind each other of this. Once we say the positive benefits of letting girls enjoy the outdoors and simply have fun instead of winning, it became easier. When there is a start and finish line, the competition is on! When we are with eight year olds playing game, we rein it in! I don't remember my first bike ride because that happened at a very young age. I do remember my first mountain bike ride in high school. I had no idea what I was doing, but loved the really technical sections of trail that tested you. Immediately, it was a sport that I wanted to be good at, so I started riding more. My nerves are always concurred by positive thoughts. The mantra that really calms my nerves is if they can do it, I can do it. It's true for most people out there; you just have to believe it. Yes! Start on a grassy field; clip in and out a few times before you go trail or road riding. Everyone has a story when they fall over because they couldn't get out. Don't get discouraged by this. Just accept that when you start with clipless pedals, you too will have a story to tell. Speed and distance traveled. You can go faster and longer than most any other sport. You are slower than cars and faster than runners making it the best way to see the world. I love that about biking.